While the wait for Half-Life 3 continues, Valve boss Gabe Newell had some good news to share for VR enthusiasts. The company behind the Left 4 Dead and Team Fortress franchises is working on not one, but three "full" VR games. "When I say we're building three games, we're building three full games, not experiments," Newell told Eurogamer, with the new titles being built using the Source 2 and Unity engines. Valve, which worked alongside HTC to develop the room-scale HTC Vive VR kit, is looking to build brand new IP around virtual reality experiences, rather than redeveloping its existing, popular titles. "VR is not going to be a success at all if people are just taking existing content and putting it into a VR space," said Newell. "One of the first things we did is we got Half-Life 2 and Team Fortress running in VR, and it was kind of a novelty. That was purely a developer milestone, but there was absolutely nothing compelling about it, the same way nobody's going to buy a VR system so they can watch movies." So while VR reworkings of classic Valve titles is unlikely, it means the company will be working full-on with high-end virtual reality experiences. "It's about taking bigger leaps forward with the kinds of games that we can do," he added. From the sounds of Newell's comments, he has no qualms about leaving behind those not willing to invest in the pricier end of the VR market. For Valve, it's about building a compelling enough VR software experience to coax gamers to more expensive hardware, rather than initially reducing the hardware cost at the expense of showstopping software potential. "Once you've got something, the thing that really causes millions of people to be excited about it, then you start worrying about cost reducing. It's sort of the old joke that premature cost reduction is the root of all evil," he said. Newell's comments echo those of Elon Musk, who saw that electric cars had to become a premium, desirable, product in order to become a viable product category in the long-term. But it may not be the current generation of VR headsets that Newell is aiming at - working closely with the hardware manufacturers, Newell suggests that massive improvements to display technology will power Valve's forthcoming VR experiences. "You'll actually see the VR industry sort of leapfrogging pretty much any other display technology in terms of those characteristics. It's probably not obvious from the first generation of products, but you'll start to see that happening like in 2018-2019," he said. With that 2018-2019 window in mind then, it's probably not quite time to hold your breath for Valve's new titles. This is a company that takes its time to craft its next big thing, and doesn't shy away from scrapping many months of prototyping work entirely. But it's heartening to see Valve so invested in the emerging tech. After an exciting start, the amount of jaw-dropping VR experiences has somewhat plateaued. 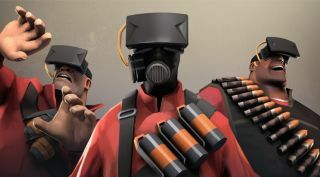 Valve throwing its hat into the ring fully could be the jumpstart virtual reality needs.